GlobalSign Code Signing Certificates are used by developers on all platforms to digitally sign the applications and software they distribute over the Internet. Including the name of the publisher and protecting against malware injections and other corruption, signed code provides customers the same security as store bought, shrink-wrapped software. 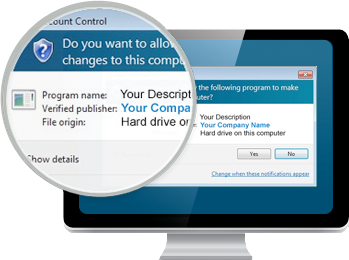 Code Signing Certificates use a unique cryptographic hash to bind the identity of the publisher to the software. Security warnings that appear with unsigned code are replaced with notifications containing the software publisher's information, preventing users from abandoning the install and increasing download rates. Signing code adds an essential layer of trust to the installation process. Digitally sign Windows 32 and 64 bit files including .exe, .cab, .dll, .ocx, .msi, .xpi, and .xap, ActiveX controls, and kernel software. Digitally sign Adobe AIR applications. Adobe requires all AIR applications to be digitally signed in order to run successfully. Digitally sign applications, plug-ins and content for Mac OS desktops. Digitally sign Mozilla and legacy Netscape Object files. Digitally sign macros and Visual Basic Applications (VBA). Compatible with Microsoft Office and other applications using VBA. Digitally sign .jar files and Java applications for desktop and mobile devices. Recognized by Java Runtime Environment (JRE). Generate your Certificate Signing Request (CSR) before application. For help with this, please consult our guide.